GREENPOINT — Developers hoping to rezone a block on McGuinness Boulevard for residential use got a stamp of approval from Williamsburg Community Board One Wednesday night, clearing the next hurdle for construction of an eight-story mixed-use building on the strip of gas stations and warehouses. The 155,000-square-foot development would include 28 units of affordable housing, a handful of small retail businesses on the ground floor and a parking lot with nearly 100 spots, the developer Paul Pullo said. "This is the only block in the area that doesn't allow residential use," said Richard Mazur, executive director of North Brooklyn Development Corporation which is partnering with Pullo in the plan. The surrounding blocks on McGuiness Boulevard he said, had been rezoned for residential use back in 2005. Not only was the rezoning logical, said Mazur, but most importantly it would answer a community need for affordable housing. "I'm partnering with Paul Pullo specifically for the 28 units of affordable housing," Mazur said, "for our population that really needs it. I've got at least 500 people on a list needing affordable housing in the neighborhood." 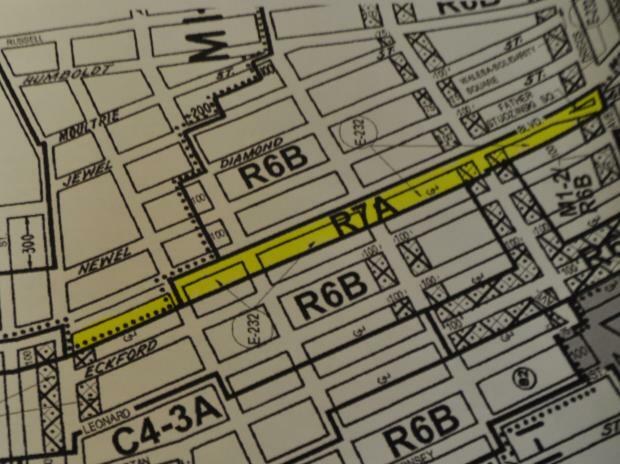 The rezoning proposal now must go through the New York City Department of City Planning.